“Please don’t blame [poor sleep on] changes in the weather–it is never too hot or too cold to sleep well” (Healthy Sleep Habits, Happy Child, page 226). Now, I think Weissbluth is a sleep expert–no doubt. So then I think, why would he make such a statement? I think the answer lies in the context of the statement. In this section of the book, he is talking about the importance of not overstimulating a child (which he defines as keep up too long). He is cautioning parents not to keep baby up too long and if you do, baby won’t sleep well. He then makes his statement to not blame the temperature. I think (my interpretation) what he is trying to impress is the importance of waketime length and to not fall into a trap of blaming what isn’t at fault. He does make several of contradictory statements throughout the book (like, Never wake a sleeping baby versus wake baby if needed to preserve future naps), so he will make a strong statement in order to make a point without using qualifiers and caveats. My assumption is that this statement falls into that category. I think temperature is very important to consider for good sleep. We need to be dressed appropriately for the temperature in the room. As things have warmed up this summer, we have had to remove several of Brayden’s blankets he loved to sleep with during the winter. When he gets too hot, he has night terrors. You obviously aren’t sleeping well during a night terror. In the end, despite this one-liner in this book I respect, I still stand by my belief that temperature is an important factor to consider with good sleep. We turned out AC on a few times so far and one night I forgot to switch it back to heat. I woke up freezing, checked the thermostat and saw just how cold it was in the house! I turned the heat on and went back to bed. And I consider myself a pretty good sleeper! We've been living in South America since our oldest daughter was 2 months old (she's now 2 and our youngest is 2 months). The temperatures are extreme – both hot and cold – and there's little to no insulation in our house. Add to that the fact that there is no central air/heat to speak of, AND the only room air units are in the living room and our master bedroom. Needless to say our oldest has adjusted to sleeping in whatever temperature it happens to be (still to be decided how the little one will do). Of course I dress them appropriately – footed jammies layered on top of leggings and long sleeved onesies in the winter and just diapers in the summer – but they have been rather resilient with the temperature changes. It may just be a "personality" thing…or a learned preference, or, my belief: God's blessing for my husband and I!!! I don't know what we would do if the girls couldn't sleep well in a range of temperatures! Agreed. My LO actually started sttn after we figured out to stop putting her in those fleecie footie jammies. I hated those as a kid, but it was so cold in her room, I thought she needed them! She's a much better sleeper when it's colder. Thanks for all of your comments.Kristy I like your points–some people have a wider range but I would say your son is normal in that most if not all people have some cut-off point. In coastal south Georgia, I promise you, it can definitely be too hot to sleep! 🙂 I've been here my entire life and summer never gets easier. 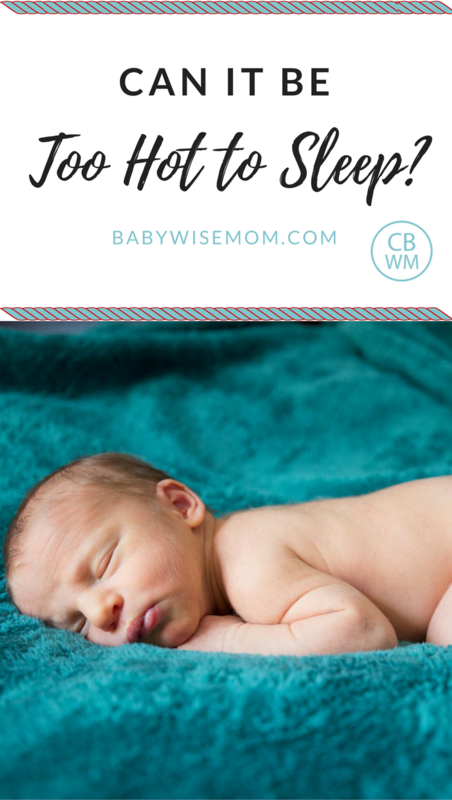 It's normal to still be 80 degrees out with 100% humidity when we do bedtime between 7pm-8pm…I know I like to be on the cooler side when trying to go to sleep, and I think both of our boys do as well. Ethan is 14 months, and does have trouble sleeping when it's hot. Thank God for AC that is working :)Good luck with the rest of your pregnancy this summer! My daughter sleeps in a diaper only with the house at 70 degrees or cooler. Any warmer or more clothing and she cries in her sleep for the first five hours then wakes up hysterical and sweaty. She actually has to be cold to the touch! Took us a long, long time to figure that out!! !